Towards the latter part of Olga Pericet’s exceptional and quirky “Enfoque” (Focal Point), Inma “La Carbonera,” the cantaora (female flamenco singer), flung a bucket full of spent castanets onto the stage. Pericet took off her shoes, walked among them and observed them as a military commander would survey his troops. She then put her shoes back on, did some scraping, dragging movements with her feet, pulled at her top, performed robotic movements, balanced on one foot, then went into a series of fast footwork, followed by slow and then very rapid, astounding heelwork. 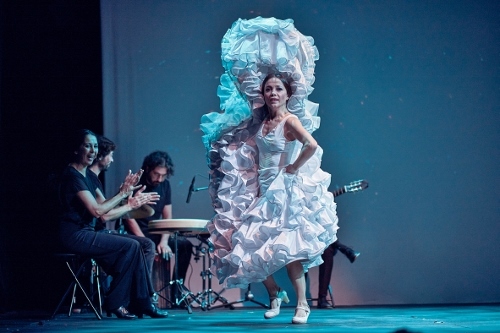 I don’t know what the smashed castanets meant, but the intrepid Pericet is certainly a master of smashing tradition as her new show at the Repertorio Español (October 3-21) honoring the legendary bailaora (female flamenco dancer) Carmen Amaya demonstrated. Pericet opened the show in a “masculine” outfit: high-waisted white trousers and a white top that resembled a sports bra, with her delicate ribs peering out. This section resembled a contemporary dance work. She performed sharp robotic movements and clapped her hands mechanically towards each other without them touching, as if to parody the hand clapping in flamenco. Then she put the pedal to the metal and astounded with her fast footwork. Throughout the show, there were these mood swings: times of calm, followed by explosions of incredibly fast and furious footwork, which left the audience gasping for breath, but not the cool, in control Pericet. From the masculine to the super feminine: a dazzling white traje de flamenca. From the hips downward, Pericet was encircled in layers of ruffles as if in a field of ginormous gardenias. Hard enough to strut in a normal traje with train, but Pericet maneuvered this caboose with her strong feet as if it were a mere insect to be swept aside. She then slipped out of the dress, stripped down to a beige leotard, and exited. A member or two of her ensemble then folded the dress and transformed it into a screen in which there were blurry black and white film scenes of Amaya fast footing it. In other words, Pericet let Amaya speak (or dance) for herself. In that, Pericet has been successful, providing the audience with the thrill of experiencing her own genius while she channels the indomitable spirit that was Amaya. The all-Spanish ensemble that accompanied the Córdoba-born Pericet, and provided musical interludes, consisted of two singers, Manuel Lavi and La Carbonera, who does magic with her remarkable vocal range, guitarist Antonia Jiménez Arenas and percussionist David Chupete, all masters of their instruments. 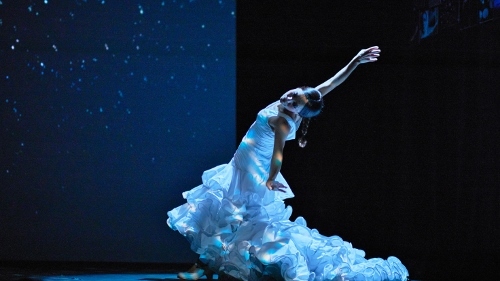 “Enfoque,” which is the first of Pericet’s performance pieces in a series of new choreographic works, will have its final performance at the Teatros del Canal, c/de Cea Bermúdez, 1, Madrid, Spain, on May 25 and 26, 2019. Olga Pericet and musicians in “Enfoque” (Focal Point).